While some people react calmly to neglect, others can become extremely upset. No one wants to feel neglected by someone they love, but we all have our own responses to it. 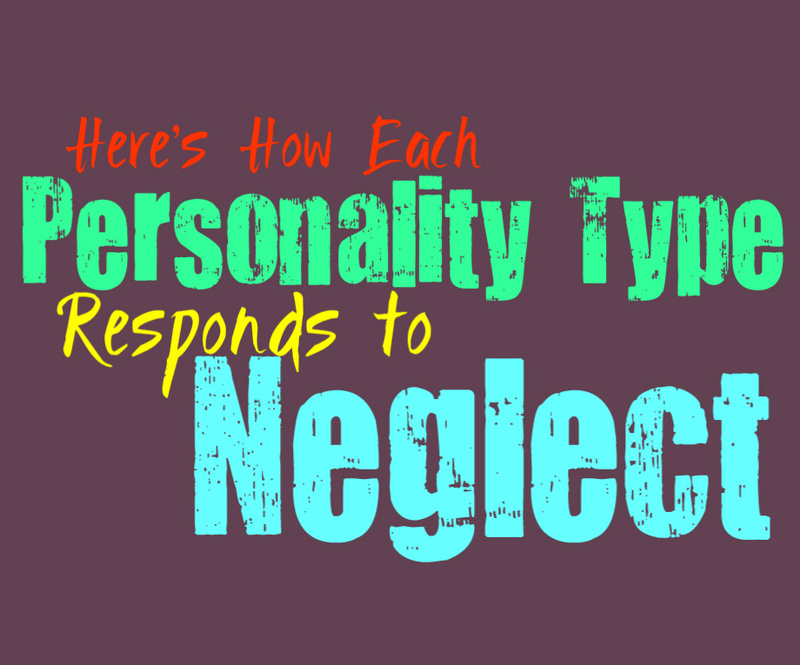 Here is how each personality type responds to feelings of neglect. INFJs are independent people, who often distance themselves from others. When the INFJ does connect with someone, it means a lot to them. At first signs of neglect the INFJ will likely attempt to brush it under the rug, and make excuses for that person’s behavior. After a while, they will likely start to blame themselves and feel like they have done something wrong. This can be very hard on the INFJ, since they naturally put too much pressure on themselves. After a while the INFJ will likely realize that the person neglecting them simply does not value them or care enough, and will ultimately step away from them. INFJs are no strangers to removing people from their lives, they simply don’t want to do it unless they absolutely have to. ENFJs don’t enjoy feeling neglected, especially by the people they love. They spend so much of their energy caring for others, that they really don’t ask much from people. When ENFJs feel like someone is truly neglecting them, they will try to give them a chance to right the situation. They might continue to try harder to impress and care for that person, but will exhaust themselves eventually. When the ENFJ realizes that the neglect is unlikely to change, they will become very upset. They will likely express this to the person hurting them, but if things don’t get better they will feel the need to remove that person from their lives. INFPs certainly don’t appreciate feeling neglected, especially by people they love and trust. It takes a lot for them to connect with someone, and they value those bonds deeply. When the INFP notices that they are being neglected, at first they will be very hurt and might blame themselves to some extent. They will try to find ways to make things better, and will even reach out to that person. They don’t want to throw away their relationships, and often try hard to fix whatever is wrong. INFPs can become rather emotional when it comes to their loved ones, and will feel the need to express this. To INFPs it is extremely important to have the people in their lives pay attention to them, and will become depressed over the situation. ENFPs value their relationships, and they truly hate being ignored by their loved ones. When they feel like they are being neglected the ENFP will be extremely hurt and a bit depressed. They want their loved ones to pay attention to them and to show them that they are important. ENFPs will make time for the people they care for, and simply want that in return. For them independence is important, but they also believe in showing that you care and making the effort. They will become extremely hurt when they are neglected, and will begin to distance themselves from that person. INTJs are driven and intelligent people, who focus mainly on absorbing knowledge. While the INTJ is more internally focused, they still value their relationships deeply. They don’t open up to many people, but once the INTJ does care for someone they take that very seriously. INTJs enjoy plenty of space in their relationship, and really don’t require much attention to be happy. What they truly need is trust and loyalty, and will take a lot to feel neglected. When someone really is being neglectful of the INTJ, they will likely make the appropriate steps to finding out what is wrong. If they ultimately discover that things cannot be changed or that person refuses to make amends, then the INTJ will be forced to move on. They prefer to try their best to mend a relationship though, and don’t want to back out on a commitment. ENTJs believe in loyalty and trust in any relationship, and want their loved ones to value that. When they make a commitment or connection with someone, the ENTJ does not take that lightly. If their loved ones are neglecting them, it can be rather upsetting for the ENTJ. They don’t need much, just someone who appreciated them and stands by them when they are needed. If their loved ones is being neglectful, the ENTJ will likely be upfront with them and try to rectify the situation. If things cannot be changed they will be forced to end the connection, and move on with their lives. INTPs enjoy having space in their relationships, since they have such internal and personal thoughts. They don’t need constant attention and will likely feel smothered easily. While INTPs do enjoy independence, they also believe it is important to value their relationships. They want their loved ones to appreciate and support them, and dislike feeling neglected. At firs the INTP will likely begin to distance themselves, and try not to take the neglect to heart. Eventually those emotions will boil over, and the INTP might become very upset. Ultimately, they will find it necessary to disconnect from the person hurting them, and move on. ENTPs value their bonds, and take a while to truly connect with someone. They enjoy having plenty of space in their relationships though and are very independent people. While ENTPs enjoy space, they also need a certain amount of affection and appreciation from their loved ones. They definitely do not enjoy feeling neglected, and will likely take it very personally. They might blame themselves at first, and will feel somewhat depressed over the situation. The ENTP will try to find a way to fix things, and hope that their loved one will pay attention to them again. If things don’t work they will push forward until finally they have to disconnect from that person. ISTJs are hardworking and loyal people, who value their relationships deeply. They don’t want to feel smothered, and do enjoy having plenty of space. While ISTJs enjoy space, they also believe in showing appreciation and making time for their loved ones. If they feel like they are being neglected, it can truly upset the ISTJ. They aren’t overly emotional people, but they believe in loyalty and commitment. They will likely attempt to make things right, without pushing things too hard. They want to be sure to put in as much effort as possible to maintain the relationship, before they are forced to move on. ESTJs take their commitments very seriously, and have a hard time disconnecting from someone they are for. They will likely blame themselves if things go poorly in a relationship, and put the pressure on to fix things. When the ESTJ feels neglected they will likely try to make that clear, and will hope for a change. They don’t want to just throw away their relationships, and truly believe in loyalty and commitment. The ESTJ will continue to push in hopes that their loved one will finally learn to appreciate them. It takes a long time before ESTJs will step away from someone they are fully committed to. ISFJs are caring and giving people, who work hard to tend to the needs of their loved ones. When the ISFJ feels as though they are being neglected, it can hurt them very deeply. They take their commitments seriously, and don’t enjoy feeling like they aren’t important. ISFJs will blame themselves at first, and will try to do what they can to regain their loved ones favor. Ultimately they will try to mend things, and will push to find a way to solve the problem. ISFJs definitely don’t handle neglect well, and become extremely hurt by it. ESFJs hate feeling neglected by their loved ones, and will take it very personally. Being neglected by the people they strive to care for, is something that can wound the ESFJ. They simply expect affection and appreciation in return for all of their loyalty and efforts. When the ESFJs loved ones neglect them, it will hurt them deeply and often affect their self-esteem. They simply want to feel close to the people they love, and are happiest when they are connected to those people. ISTPs are intelligent and logical people, who love having their own space. They don’t need to have attention constantly paid to them in order to feel loved. They want to be close to their loved ones, but they also enjoy their freedom. ISTPs don’t require much affection in order to still feel close to someone, which makes them somewhat difficult to neglect. If the ISTP does actually feel like they are being neglected, they will be honest about it. They will give their loved ones a chance to change, but ultimately they won’t stick around if things don’t get better. ESTPs definitely do not like being neglected, and often require a decent amount of attention from their loved ones. If they feel like they aren’t having enough attention paid to them, they can get really upset. They care deeply about the people close to them, and want to feel like they are a priority in their lives. The ESTP will likely express that they are upset, and try to find ways to bring the relationship back to life. They can become a bit chaotic when they are feeling neglected, and will search out new adventures to distract them. ISFPs can become rather hurt if they feel neglected by someone they love. They try to give space, and don’t need to be smothered with affection. If the ISFP does feel like they are truly being neglected, they will often internalize this for a while. They might try to consider what they could have done wrong, and will feel a bit guilty. When they realize it is not their fault, the ISFP will likely try to talk to their loved ones about it. They will search for solutions, and certainly are willing to give someone the chance to mend things. If they continue to feel this neglect though, the ISFP will feel the need to move on from that relationship. ESFPs absolutely despise being neglected, and require a lot of attention from their loved ones. They simply enjoy feeling connected to the people in their lives, and dislike the rejection. ESFPs will find ways to express their sadness, and reach out to the people they feel are neglecting them. ESFPs believe in being open and honest about their feelings, and don’t enjoy being held back. When they feel neglected they might find ways to act out in order to get what they want.